Alas, 2016 is drawing to a close. It's been a difficult and disturbing year. There have been good moments, but a lot of really bad ones. In this issue of Sightings, Martin Marty, takes a look at what he calls the "religiocification of hate." His point is that this year has seen a significant uptick of hate that is connected to religion. He notes that the biggest target has been Muslims, and it has emerged out of religious sentiments. When it comes to hate and religion, it is wise to look inside and consider how we might be different in the coming year. I invite you to read and reflect and respond accordingly, with the hope that 2017 is different! 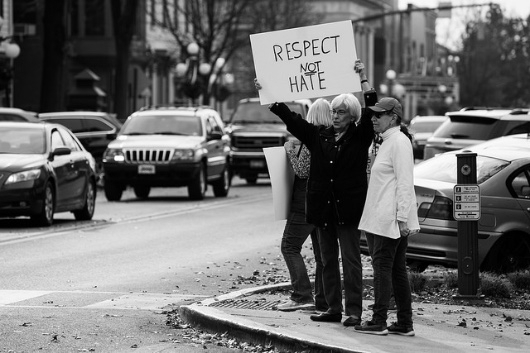 Today’s Sightings draws upon last week’s report of a Pew Research Center survey identifying the targets of the most “discrimination” (which in most cases is based in, related to, or magnified by “hate”) in the United States. Pew notes that 82% of polled Americans think that Muslims are the most targeted victims of discrimination, with 57% saying they face “a lot” of discrimination, up 12% since 2013. They passed up blacks, LGBTs, Jews—and, oh, yes, evangelicals (? )—as those who suffer the most discrimination. It’s an ever-changing scene; yes, “hate is mobile”—and portable. One might wish or hope that religion and religions would help turn away haters and counter hate, but just the opposite is visible. “Hate” and group animosities show up on the first pages of the Hebrew Scriptures/Bible, as they do in most holy books of faith communities. Almost all of these texts also propose, envision, or command the pursuit of ways for love and understanding to counter hate—and for, say, “acceptance” to win over “discrimination.” But 2016 was not the year to see much of that, despite some good efforts by Pope Francis and many less well-known charismatic, courageous, and tireless leaders and ordinary folk in their faith communities. A quick test of how vividly “discrimination” shades into “hate”? Hit the attached link for a report of Pew’s findings and there read, if you can bear it, some of the several hundred responses. In this case, most of the fury, obscenity, and un-understanding is directed at Islam, because Muslims were the lead subjects in the news-making survey. We cannot end this issue of Sightings merely on a low and negative point. It is also important to see how citizens can turn from their hate-mobiles. Again, not for the first time this year do we quote philosopher Max Scheler, and what I call his “Three Alases.” When things are bad because of the evil in our heritages, he counsels, we can say, “Alas! What did our ancestors do?” It’s important to know that, but we can’t change the past. Scheler’s second one is, “Alas! What have I done?” But that, too, refers to an unchangeable past. The third one, however, looks to the personal, to the present, and to the future: “Alas! What kind of person am I that I am capable of hating other groups?” That question, says Scheler, may lead to a “change of heart,” and a better future. End of sermon. Forward to 2017. - Harvard, Sarah. “Americans believe Muslims face the most discrimination in the US, new survey says.” Mic. Reposted with comments at AOL.com. December 9, 2016. - Marty, Martin E. “Georgetown.” Sightings. June 6, 2016. - —. “Hate Is Mobile.” Sightings. June 20, 2016. - —. “Muslims in the South.” Sightings. October 5, 2015.